Last month’s article involved getting brake system parts torn down for re-build and the installation of the gas tank. Up to this point, the rear hatch had been painted and safely stored in a corner of the shop. Now it was time to install the hatch and its glass. First I inspected the hinges for any sign of damage. On several cars I have owned, hinges take a beating. I was surprised to find the 40 year old E-Type hatch hinges to be in sound condition. So I placed them to the bead blast cabinet and took off the old paint and then I gave them a coat of epoxy primer, basecoat, and clearcoat to match the exterior color. Next I mounted the hinges on the hatch and then presented the hatch up to the rear of the car. I got the hinge bolting started single handedly but this job would be much easier with an assistant. At this point there is much trial and error required to adjust the position of the hinges for a satisfactory even placement of the hatch in its opening. At some point I was dismayed to see that the curvature of the hatch along the bottom edge was not really a very good match to the opposing body. But since everything was finished and painted I decided to live with the fit. In retrospect, I should have mounted the hatch onto the body using its hinges during the bodywork phase to check its fits and make possible adjustments. The next step was to fit the hatch gasket. This is actually a two piece affair. There is a traditional rubber gasket which serves as an air and water seal. Next to it is a harder plastic trim piece which I believe is called a “finisher” in that it serves to cosmetically provide a transition from the rubber gasket to the inside upholstery material (yet to be installed). Both pieces are supplied a little long and can then be cut to fit the exact perimeter distance of the opening. I installed the finisher piece first without glue, as it has a lip that holds it in place. The rubber gasket is finally installed using a glue such as 3M Super Trim adhesive. This adhesive is similar to contact cement in that it is put on both surfaces, allowed to dry until tacky, and then the parts are brought together. Oh, first I dry fit the parts without adhesive, closed the hatch, and left it overnight before gluing, to allow the rubber and the finisher to relax into position. That way they are easier to put into final position, especially gaskets that have spent time coiled up in a tight loop for storage. Next I was ready to tackle the glass. Fortunately my rear hatch glass was in pretty good shape. I did have to solder on one new wire for the lead to the defrost element. I have noted that XKs Unlimited is advertising the availability of new rear glass, if you need to purchase one. 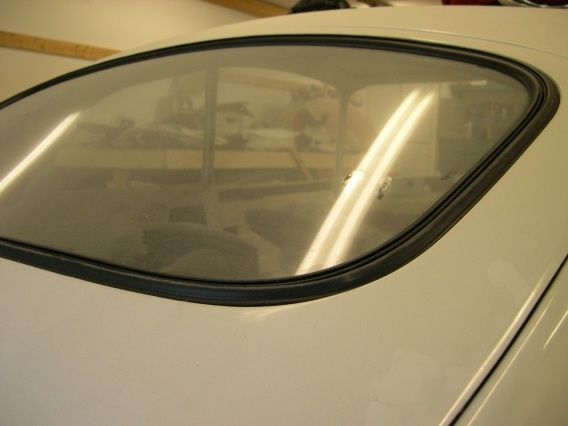 There is a single continuous loop gasket for the rear glass that you will need to purchase. It is a rather convoluted affair, with a set 3 grooves. One fits the sheet metal opening, one the edge of the glass itself, and one a piece of brightwork trim that goes in last. All I can say is that you will have to study the seal to determine which groove is which. I test fit the seal onto the sheetmetal and also on the glass. The trick is to get it onto both at the same time! I wish I could tell you some magic trick for getting the parts assembled but it seems to be a brute force effort. I did liberally coat the seal in a rubber lubricant product (Armorall, etc) to help everything slide together easier. The help of a friend for this job would be great also! I eventually got everything into position. In the photo, the finisher strip is not installed but it simply presses into the groove and should be easy to install. It was a satisfying milestone to close the hatch onto its seals. I’m not sure why but in a fit of optimism I started thinking about ordering an upholstery kit. Except I found out the proper term in the business is a “trim” kit, as in one trims out the interior. There are really only a few players in the Jaguar upholstery business. Most of them advertise in our national JCNA magazine. As a means of picking amongst the several firms, I went with the recommendation of the head trimmer at XKs Unlimited, Carl, who said he had very good luck with BAS Ltd. BAS has a website (www.basjaguartrim.com) which has some good information on their services. 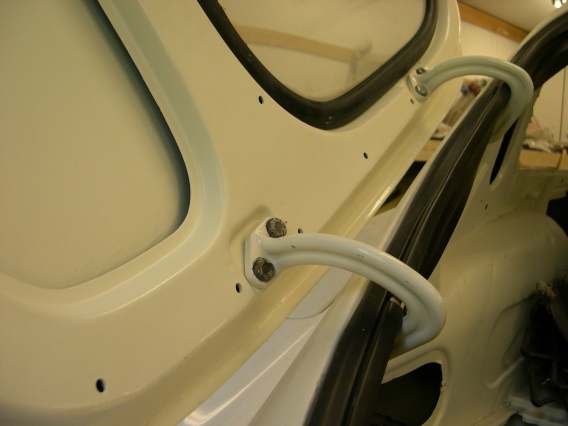 BAS prides themselves on providing trim materials to the original specification used by Jaguar. They have a number of colors represented on their website. I don’t really trust web photos for totally accurate color presentation but they are close enough to help you narrow your choice down to a few candidates. I have been thinking about reds, my wife Kelli is a fan of tans, and I also found in one of the various originality guides that old English white cars could have come with a blue, black, or green interior. So I contacted BAS and ordered samples of each of these colors. After the samples arrived, Kelli and I took them out and matched them up to the car. As with paint samples, I like to see the samples in direct sunlight, shade, and fluorescent lighting. 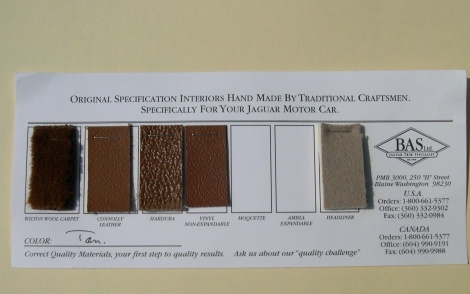 After much spirited discussion, I was talked out of red and steered to a tan sample as our first choice. I actually also liked the green but was worried that it was one of those love it or hate it colors. It is interesting to note that there are a variety of materials used on the E-Type. Leather is of course the major material used. There is carpet and the headliner material. But hardura, moquette, and vinyl are also used. I had no idea! The next step was to contact BAS by phone to gather some details. The salesman, Bart, was very helpful and gave me some useful suggestions. There is of course a base kit and then there are add-ons and options. Options include items like dash pads and sunvisors. BAS can also trim out your seats and the center console, as it is practical to ship these items to them using UPS. So I made up my mind and placed an order. Oh, another 1 month backlog for them too. It seems to be common. Once I had sent off my deposit check so as to establish my place in line for fabrication of my kit, I decided to strip down the seats to paint the frames and check for missing or broken parts. You may remember that I purchased a pair of used Series 3 seats from Stephan Roundy as I wanted headrests and the reclining feature. I took the existing leather covers off these seats (one set would be sent to BAS as patterns) and took off the internal foam and suspension parts. When I had only metal parts left, these were toted over to the beadblast cabinet for stripping. I repainted the frames with black spray can enamel, as they exist in a benign environment which doesn’t justify a more rugged paint such as urethane. I also fabricated a new wooden tack strip out of 3/8″ thick plywood to replace the existing ones that were in very bad shape. I also stripped the material off the back seats (remember, this is a 2+2) and once only metal parts were left, bead blasted them and painted them also. So these items would be ready for the re-trim effort.